Manufacturing high-precision surfaces in an efficient manner with minimal workpiece finishing time is a primary objective of manufacturing engineers working in fields such as aerospace, transportation and energy. Components that have intricate shapes with very low finishing tolerances are often needed. The effects of component stress as a result of the manufacturing process are also a concern for components that will be functioning under extreme operating conditions. The Extrude Hone ECM machining process provides solutions that will give you the results you need when precision, consistency, time and quality are critical. The electrolyte solution transfers charge in the gap between the cathode and workpiece, which causes electron transfer from the workpiece to remove surface material. The separation distance between the cathode and the workpiece is key to regulating the material removal process. The shape of the cathode determines the final shape of the workpiece or the impression (imaging) placed upon the workpiece. The speed of material removal is dictated by the DC current applied. The amount of material removed is defined by Faraday’s Laws. The material removed during the process must be filtered out of the electrolyte stream in order to maintain constant electrolyte quality in the gap between the cathode and the workpiece. The workpiece material must be corrosion resistant. Our ECM Tooling Provides the Edge. The fixture including the tool (cathode) is a critical element of the ECM process because its properties and shape determine where and how much material is removed from the workpiece. The cathode is designed to maintain a gap between itself and the workpiece surface. The electrolyte flowing between the cathode and the workpiece (the anode) ensures the removal of the material when flushing the gap. Because the cathode never comes into contact with the workpiece, the tooling has no process-related wear. 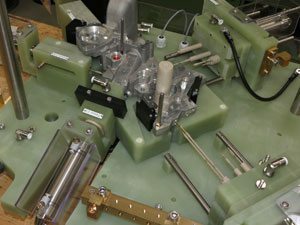 Our team of manufacturing professionals will work with you to determine the best possible tooling design for your project. Ensuring that the design of the cathode fits the workpiece area to be machined using insulation to protect the workpiece from the ECM process in other areas. Controlling the gap by designing the appropriate fixtures including cathodes. Providing short circuit detection at the DC source. Ensuring the cathode is made out of electrically conductive materials. Defining the best electrolyte for the application including use of NaCl, NaNO3. Contouring / Shaping: Creates a pre-defined 3D surface profile. This is accomplished through mapping of the cathode geometry into the workpiece. Radiusing: Creates a defined edge rounding. 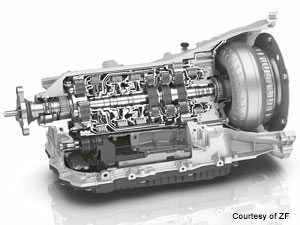 An example is the treatment for gears. Deburring: Removes burrs at bore exits and at intersecting holes in a workpiece caused by conventional drilling. Micro Structuring: Creates defined surface structuring to optimize the tribology at the component surface – retaining oil at a bearing surface. Design accuracy. Workpiece material is removed only at precisely defined locations. Enhanced component longevity. There are no mechanical loads or thermal loads on the workpiece. Process efficiency. Both workpiece roughing and finishing can be completed in a single pass. Because ECM is a dissolution process, no primary or secondary burrs are generated. Deburring precision. ECM is an ideal deburring process for parts where burrs are difficult to reach or machine using conventional methods, and it eliminates the challenge of secondary burr formation. Increased productivity. ECM is a highly productive process. 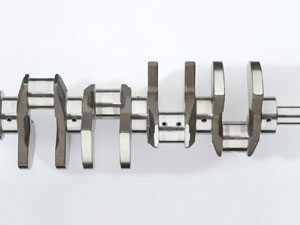 The process time is fast as compared to conventional methods and multiple parts per cycle can be machined resulting in a lower unit cost of production. Quality and repeatability. The ECM process is highly stable with very good process control which ensures accuracy, quality, consistency and the highest repeatability. As ECM follows Faraday’s Law, material removal is controlled by monitoring the applied current over the course of the ECM process time.